Believe it or not, not everyone wants a full-blown work at home job. Some just want to earn some extra cash from home so they can continue to work their jobs outside of the home. If you’re one of those people, I’ve made your job very easy by bringing you this list of online and offline ways to make some extra cash from your home. Get Paid To (GPT) sites are great ways to earn some extra money doing a variety of tasks, like searching the web, taking surveys, or even watching videos. You can sign on to them daily, do a few quick tasks, and earn a couple of dollars quickly. Swagbucks (review) and InboxDollars (review) are two of the fastest earning GPT sites. Taking surveys online is the first way I ever made money from the web. That was almost 20 years ago, and I’ve been doing it ever since! 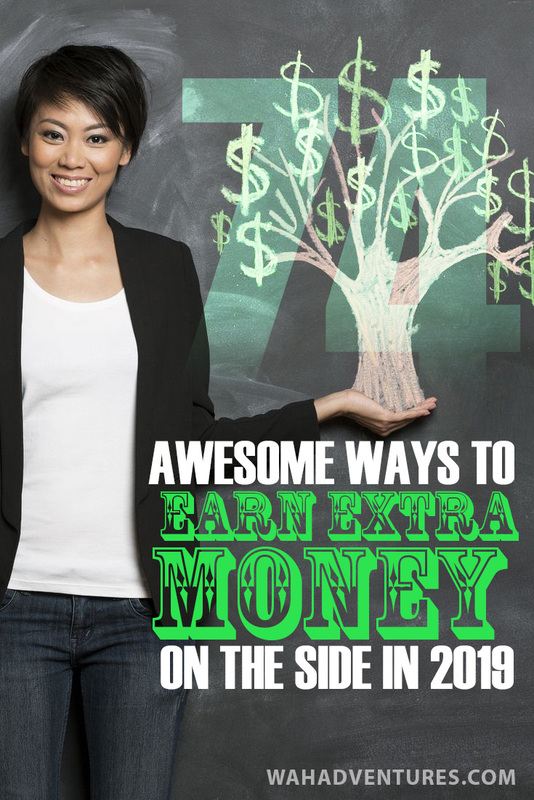 It can feel tedious if you try to do it for a lot of income, but for some extra cash – about $50 to $250 a month – it’s perfect, and can actually be fun. MySurvey (review), Toluna (review), and Vindale Research (review)are some of my favorite survey sites – try them out! Surely you’ve heard of all the money-making bloggers out there, right? I won’t lie and say it’s easy, but it can be done if you’re willing to work for it. If you already like to write, then you have the biggest challenge out of the way. You can write about whatever your heart desires and still gain a following. Next is setting up a website, which nowadays is super simple and can even be very cheap to do. Check out our guide to making money blogging to learn how to monetize your blog for extra cash! One of the ways most top-earning bloggers are making money is actually through coaching online. They set up one-on-one online meetings with people to teach them how to promote their business, set up a successful blog, design a website, and more. Some top bloggers earn hundreds of dollars just from an hour session! Learn how Stefan James makes over $40k per month from online coaching alone. If you love tinkering with graphics, you may be able to design logos for businesses with 99Designs. The website matches businesses and individuals in need of logos with designers who can create them. If a company or individual chooses your logo, you get paid! Once you gain more reviews and experience on the site, you’ll start to gain a following and people may choose you directly to design something for them. Another way to utilize your design talent is with Zazzle, but now you’ll create designs for t-shirts! This gives you a lot of room to be creative, so it can be a fun way to earn some cash. You can also put your designs on things like home décor, phone cases, cards, and more. Alternatively, you can just sell your designs for people to choose to put on their own choice of products, and you can set your royalty rates. Doba is a drop shipping company that lets you weed through its products, choose what you want to sell, upload the products to your own website, and start selling. The beauty of drop shipping is that you don’t ever have to store any products – Doba takes care of that for you! You sell the product to your customer and then order it through Doba, and Doba will take care of sending it to your customer. One of my favorite ways to earn money online without doing a lot of work is by entering blog giveaways. They’re free to enter, and you usually only have to do a few quick tasks to complete your entry. Usually, it involves something simple like following an account on social media. 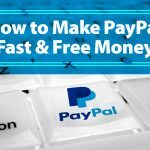 Bloggers give away PayPal cash often since it’s a big traffic driver to their websites. You can pretty much do anything on Fiverr, as long as it’s online. If you have a special digital talent, set up a gig on Fiverr to make some money with it! Fiverr’s great for quick tasks, but people also have more in-depth programming, writing, translation, and video gigs for higher prices. The best part is that you can set your prices, so you never have to feel like you’re getting short-changed. Freelancing is the new way to work, and it’s pretty amazing. People all over the world are turning to freelancing for part-time or full-time income, or even side cash. You control the times and days you work, set your own prices, and create a flexible business for yourself. The best places to get started are Upwork and Guru. They have tons of jobs available in several categories, so spend some time browsing them and apply for whatever floats your boat. Needle is a flexible online job that you can do in your spare time. You’ll be a chat assistant helping online shoppers find the products they’re looking for. If you have expertise in particular online brands or shops, make sure you let Needle know in your application because it’s a definite asset for this work! Read our full Needle review. You can set up a shop on Etsy for free and start selling homemade and vintage items! This is the perfect opportunity for you if you love crafting and creating unique items. Many sellers make 100% of their living from selling their goods on Etsy. You can even sell digital products, like websites and designs. If you want more options like Etsy, here’s a whole list of them! Microtasking is one of the best ways to make money in a flexible fashion. These super small gigs will usually earn you a few cents to a few dollars each, but they can add up fast. Try Amazon Mechanical Turk and Microworkers. You choose the tasks you want and when you want to do them! Focus groups are like long-winded surveys. They’re longer, will require more time, and will pay much more money than a survey. Best of all, some places have focus groups available online! You’ll get to test out products or services and provide your thoughts on new ideas. No need to look for a publisher for a book. You can self-publish your eBook on Amazon, perfect for Kindle! It’s the cheapest, easiest way to get your book to the public and you can immediately start earning money. You even set your own prices, which you can change at any time. You’ll earn 70% royalties! Oh, and did I mention it’s completely free to publish? As a Good Starter for Pleio, you’ll remind people to take their medications and answer general questions about them. It’s very flexible, allowing you to work a schedule that works for you. The work pays between $10 and $15 per hour, so even if you worked a few hours on evenings and weekends, you could make a couple hundred dollars per month. Make money doing what you normally do on the web: search! Bing and Swagbucks are two awesome places that let you earn money while you search the web. You won’t make tons of money doing it, but it’s better than not making any at all! It sounds strange, but yes, you can sell your hair online if you’re really in a punch for money, or just want a few extra bucks. It’s better than throwing it in the trash, right? If you have long, healthy hair, you can sell it for hundreds of dollars on Hairsellon. The right person may come along and want your exact color and length and will be willing to spend big bucks to get it. BuyAndSellHair.com is another good place to list hair for sale. Just make sure you read through the guides and follow the rules for the best experience and to get top dollar. Amazon is one of the best places to sell stuff online, especially if you have new items. Many people start off small by selling new items they find on clearance for full price, start making a profit, and then can move up to higher-priced items. The Fulfillment by Amazon program is one of the best ways to make the most profit and streamline your selling. Through this program, Amazon stores and ships all your inventory so you don’t have to worry about storage costs, keeping track of inventory, or shipping! Plus, you may even sell more. Many customers are quicker to purchase something through Amazon than from a seller. That way, they’re guaranteed to get Amazon’s awesome customer service. So, even customer service, returns, etc. are out of your hands! If you have used items, large items that are inconvenient to ship, or just want to sell stuff more locally, try Craigslist. You can use it like a yard sale. Clean out your basement, list your stuff in the appropriate categories, and get money for them. Just make sure you stay safe by meeting your buyers in a busy, public location. Here are more sites like Craigslist you can use, too! Do you have furniture in your home you no longer need but have no idea what to do with it? You can sell used furniture online! Might as well make some cash on things you already have while you’re looking for your next money-making opportunity. If you end up with random gift cards for Christmas to stores you never use, sell your gift cards online! It’s easy, and most sites work similarly. You’ll enter your card information, the site will check that it has the balance you said, and then it’ll offer you a buying price, which is usually between 40% to 75% of the value. Some sites let you sell directly to other buyers to get even more profit. I personally use CardPool and Gift Card Granny to sell mine! I’ve been selling things on eBay for years now. It’s easy, it’s fast, and it doesn’t cost an arm and a leg to get your stuff sold. You can easily turn a profit by scouring yard sales, flea markets, and clearance racks to find unique things to sell for much higher prices than you paid. Some people make their full incomes just from selling on eBay alone! You can sell high quality images online for big profits. Some bloggers focus on selling through their own blog, which can rake in a lot of money, but can also be time-consuming to gain enough followers to be successful. But, there are several websites that you can sell your stock images to and get at least half the royalties. Try out Shutterstock and iStockPhoto! I use Ebates or Swagbucks any time I shop online. Sign up for them and check both sites before you shop anywhere online! 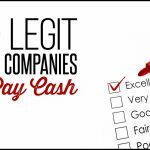 They’ll give you cash back to tons of online retailers and often have special periods where they’ll double or triple the cash back you can receive. If you’re going to be spending money buying things online, you might as well get some of it back! Website testing is a super flexible part-time job that you can do whenever you have about 20 minutes to spare. You’ll go to a specific website and follow directions of things to click and pages to look at while you’re there, speaking your thoughts into your computer microphone as you go along. This give website owners important information about what works, what you loved, and what could be improved upon. Check out this list of 20 websites that let you test websites! 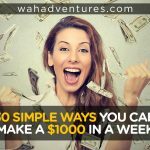 You can make anywhere from $10 to $20 for just a few minutes of your time. There are tons of transcription websites that pay people to transcribe audio files from home, but Rev is one of the most popular. It has good rates and a steady amount of work that doesn’t seem to dry up. So, it’s one of the better ones for more consistent pay. If you want more options for transcription, check out this huge list of general transcription jobs you can do from home! If you want to teach an online course but don’t want the hassle of promoting it through your website, social media, or e-mail list, you can try Udemy. This platform lets you create a course for sale using its tools that let you customize everything the way you want it. You’ll set your prices for the course and keep 97% of the profits if you want to promote it yourself. If you want to let Udemy do the promotional work (which is totally worth it, in my opinion), you still keep 50% of the revenue. You have to pay for your phone, so why not let it help you? 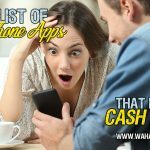 Check out this list of 93 Android and iPhone apps that pay you money to use them! One of my personal favorites is Ibotta (review), which gives you awesome rebates for doing your normal grocery shopping and buying the things on your list. As a virtual assistant, you can work from home on your own time doing a variety of tasks for businesses or individuals, like answering phone calls, sending e-mails, writing blog posts, and more. Best of all, you can treat it like your own business by finding your own clients who can work with your schedule. Check out this list of virtual assistant companies! Did you know you can get paid to watch videos? Check out InboxDollars, Viggle, and JingIt, all of which will pay you to watch videos, TV, or short ads! Picky Domains is an interesting way to make money, but it’s a way to make money nonetheless! Basically, a website owner will send his ideas for his website to Picky Domains users for them to come up with a new domain name that meets his needs. You’ll send the owner your suggestions, and if your domain name is the chosen one, you’ll get paid $25. So, there’s a chance you won’t make money, but all you’re doing is throwing out some creative ideas, so there’s not much to lose. Free Car Media and Carvertise will pay you to wrap your car in advertisements! Of course, you’ll then have to drive a car around that’s wrapped in ads. But, if you don’t mind that, you can earn a decent income every month. You may even get enough to pay your car payment every month, which makes your car pay for itself! Dog lovers can spend their extra time babysitting dogs using Rover. You can sign up as a pet sitter, set your schedule and your rates, and find people in need of your services. Rover even provides insurance for the dogs you have in your care, just in case anything happens. Babysitting has been one of the best side jobs to do at home for a long time. In fact, it’s the very first job I had! If you’re great with kids and know how to keep them entertained, babysitting can be a great way to earn some extra money. Care.com is a good place to start looking for people in your area who need babysitters, or you can always ask your friends and family if they’re looking for anyone. What could be more relaxing than hanging out at a golf course in your spare time as a caddy? You get to enjoy some sunshine and fresh air while making some money. You could also look into some other jobs on the golf course, like mowing the green, picking up balls, cleaning the carts, etc. I bet you didn’t know you could rent yourself out as a friend! On RentAFriend.com, people search for “friends” for a number of reasons, from trying out a new activity to having someone local show them around town. So, rent yourself out for a price if you’re looking to meet some new people and take on new adventures. Be the responsible one in your group of friends and offer to be the designated driver when they go out for a night on the town with a few drinks. Of course, you need to agree to a price beforehand. You could even set an hourly rate and be available for a night of bar-hopping. Do you have a local city pool or YMCA? See if they’re hiring for lifeguards! Most people can become a lifeguard as long as they’re good swimmers, in good health, and can pass the lifeguard certification. Most lifeguards work part-time and earn a decent hourly wage. Do you do most of the handy work in your own home? If so, why not get paid to do the same for others? You’d be surprised how many people would love to spend a little bit of money to have some small jobs taken care of around the house because they don’t have time to do them. You can easily fit a few small jobs into a few hours on the evenings or weekends and set an hourly rate for yourself to make some extra money each month. If you’re an awesome cook, you can start a small, part-time business for yourself catering special events. Think small to start, like birthday parties, anniversaries, or graduation parties. As you gain more experience and can put some money into your business, you may be able to turn it into a full-time business if you want! People who know how to change oil on cars efficiently can do a few cars in just a couple of hours. Whether you charge per car or by the hour, you can still easily end up with an extra $100 or more each week if you set aside a few hours on the weekends. Most people would love to get their oil changed by someone who charges less than a shop and can do the job in less time. Care.com has a section for matching house cleaners up with people who need their houses cleaned. The website has categories for the type of cleaning you want to focus on, like ceilings, windows, and floors. Once you set up your profile, you can start searching for jobs. Each job listing will detail the homeowner’s requirements and proposed hourly rate. Most listings pay between $10 and $15 per hour. Also on Care.com is a pool cleaning section specifically for those who have the means to clean pools. Of course, you’ll need special equipment and knowledge to do this job, but if you already know how to take care of a pool, you can also command a higher hourly rate. If it’s within your area of expertise, consider setting aside a couple of hours on your day off to meet up with someone in need of a pool cleaning. Most listings on Care.com range between $25 and $35 per hour for pool cleaning! Ask your neighbors or even your local parks departments if they could use a person to clean up dog messes. No one loves stepping in a dog mess when they’re walking to their cars or through local parks, and some people would be happy to pay someone a weekly rate to come clean the messes. One woman started a poop-scooping business that’s been highly successful in Atlanta, Georgia! In the winter, it can be difficult to find outdoor side jobs to do, like mowing lawns or cleaning up after dogs. But, you can always offer to clear snow for your neighbors! Sidewalks, cars, driveways, stairs, and even roofs may need to be cleared. If you charge a fair price, you’ll likely have several people who would have no problem paying you to get the job done so they don’t have to. Most younger people know how to operate a computer, but the older generations aren’t always as savvy. You can offer to teach people around your town the basics of computers, or even get more advanced if you’re into programming, graphic design, website building, etc. Hang up some flyers at the post office, laundromat, and local stores, and set up a few people at a time for a small class session. This definitely is not for everyone, but for one woman, it worked like a charm. Samantha Hess earns $60 an hour at her cuddle shop in Portland, Oregon! She provides cuddles for a price to people who crave some cuddling. It sounds odd, but it’s obviously a business people never knew they wanted – she sometimes gets over 10,000 emails a week about it! So, you could do this on a smaller scale by posting your services on Facebook and asking your friends to spread the word. Some may think you’re strange, but you’ll be the one making money! Want a good way to work on your own terms? Postmates lets you create your own schedule to deliver food from restaurants to customers! You can earn up to $25 per hour plus tips. It’s currently only available in larger cities, but you can check if yours is on the list. I’ve known plenty of people who’ve worked as pizza delivery drivers, and most of them love it because of the convenience. They can work part-time on evenings or weekends for a few hours, and they get to travel instead of staying put at one location. Plus, they can earn some decent tips in just a few hours! Between LulaRoe, ThirtyOne, doTERRA, and all the other direct sales companies out there, I can’t seem to get away from them! But, they absolutely work for people. I have several friends who have started their own businesses within direct sales companies and are doing awesome selling their stuff. Most of them do have a startup cost, but if you have plenty of people to sell to, you could make back your expenses very quickly. Donating blood is usually free, but you can donate your plasma for a profit. Places like BioLife pay you for your plasma because the process is more involved with paperwork and donation. Most places will pay between $20 and $50 per donation and will let you donate up to twice per week. That means up to $400 extra per month! This one obviously will take a lot of consideration (or at least, it should! ), but donating your sperm or eggs is a legit way to make money. For women, egg donation can pay thousands, but of course, is a more involved process than sperm donation. Men can expect up to $50 for a sperm donation, and women can expect anywhere from $3000 to $6000 per egg donation. TaskRabbit, GigWalk, and Field Agent are all apps you can use to find side jobs in your local area. 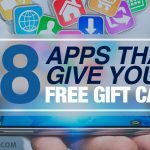 They’re great apps to use when you have a little bit of time to spare to make some money! The apps are available for both Android and iOS. Uber and Lyft are growing fast in popularity, with some people earning full-time incomes just by toting around others in their own vehicle. You can easily start up a side business with one of the companies, working your driving schedule to fit in with your downtime. If you’re looking for a change of pace from your normal, daily life, consider becoming a reality star. Most reality shows now have some sort of cash prize available. Of course, you could walk away with absolutely nothing, but – that’s show business! You could also try your hand at game shows, which may give you a better chance at winning something. Ask your neighbors, friends, or family if anyone needs pet grooming services. You can bathe pets, give them flea and tick treatments, and spruce up their fur-cuts. Street Team Promotion is a cool way to become a brand ambassador by promoting brands in your local area. You can choose to apply for the jobs that will work best with your interests and schedule. Sign up for the job list here! Earn some extra cash by taking care of people’s houses while they’re on business trips, vacations, etc. HouseSitter.com lets you create a profile so people in your area can find you if they need a house sitter. There are also other types of services available, like pet feeding, lawn care, and clearing snow. The age-old way to make some side cash! If you’re free on the weekend, visit your neighbors and ask if they want their lawns mowed for a convenient price. There are some telephone mystery shopping jobs that don’t even require you to leave your house. But, if you’re looking for something more hands-on, you can complete mystery shops in-store for some side income. MarketForce.com is a good website to find mystery shopping jobs. It even has a convenient app that lets you complete your jobs easily while you visit your destination. For most homeowners, painting is one of the most despised jobs around. You can make it easier for them if you have some time to spare by offering to paint rooms, home exteriors, trim, or even street numbers on houses. Gym and fitness fanatics can absolutely earn an income by sharing their expertise with others! In fact, it’s how a lot of top personal trainers got their starts. They found local clients to train, and those clients recommended more. You can set an hourly fee for individual clients or host a class! There aren’t a lot of music classes available in most places, so if you’re skilled with a particular instrument, this may be your area to shine. Ask local schools if you can pass out a flyer to students offering instrument classes for a per-class or hourly fee. AirBNB is a super popular way for people to earn some extra cash by renting out rooms or their full homes. It’s all a part of the growing sharing economy that lets people save money while others earn it. You can also try FlipKey, which is a good runner-up. If there are days and times your car just sits there without being used, maximize your earning potential by renting it out to others! You might as well have it pay for itself, right? Turo lets you rent out your car and bases your earnings on your car’s market value, days per month it’s rented, your location, and a few other factors. The average person could earn up to $250 per month just by renting out their car for 10 days each month! One of my brothers started up a computer repair business when I was younger. He had a full-time job, but repaired computers for a few hours each weekend and earned a decent income from it. Don’t go into this type of business blindly, though! Make sure you really know what you’re doing before you risk harming someone’s computer. If you own a truck that can handle some big loads, advertise around your local area that you’ll haul scrap metals, like aluminum, steel, or copper, for a low price. Then, you can take it to a local scrap yard to make money from the metals you collected! Try the iScrap App, which helps you locate scrap yards near you. You may think people who use metal detectors or search for ‘treasures’ are crazy, but the truth is that hidden treasures do exist! These people found crazy stuff worth a lot of money in their own backyards! And, a 12-year-old boy found a huge diamond while vacationing with his family that could be worth up to $15,000. So, keep your eyes peeled – you never know! Redbox is the popular way to rent movies, but someone has to re-stock the kiosks with new movies. So, it enlists the help of people like you! Redbox occasionally has openings for kiosk stockers and technicians to repair the machines if something goes wrong. You can become a part-time tutor online or offline, with or without a degree! You just need to be super knowledgeable in a subject and have the gift of teaching others. If you do, it can be a great way to earn some extra money, especially on weekends when kids are out of school. Pass out flyers to local schools or advertise your services in the newspaper or on local Facebook groups. DogWalker.com is the easiest way to find people looking for a dog walker. You can set your schedule and prices and people will find you through the site. It’s only $49 to sign up for a full year, which you can likely earn back your cost in just a few walking sessions. Some people enjoy washing cars, but others would rather pay someone else to do it. Car washes just don’t do the quality work that a person can do! Advertise your services around your neighborhood, and you’ll likely get a few bites. You can also post about your new venture in local Facebook groups to find more people in need of a car wash.
It’s not the most glamorous job, but someone has to do it! Many local businesses would likely be thrilled to pay someone a few bucks to clean their windows. One less job for their employees to do! You may even have some elderly neighbors who would appreciate your services. Your Turn to Make Some Cash! 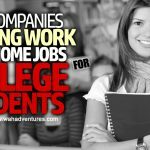 Now you know all about earning extra money from home! These are awesome ways to make money in your spare time. Who knows – if you get good at juggling a few of them at a time, you could wind up with a full-time income! Let me know in a comment what you’ve tried, what you want to try, and all about your success stories. You can also post surveys on your own websites and sell the data collected to second parties. Many local newspapers lock up the content of their articles, only unlocked after the survey is completed. I need to know how to see if a telecommuting job is legit. I know a lot of people make money delivering catalogues in their own neighborhoods. I’ve tried it before and it’s an easy way to earn a little extra. Also I’ve written review posts for products sold via Amazon and posted these as guest posts, that has also made me some nice supplementary income. I love your ideas, definitely going to try some of them! Thanks for taking the time to put them together, very much appreciated!